“A winner is you”​ – an example of poor translation. Game 1. 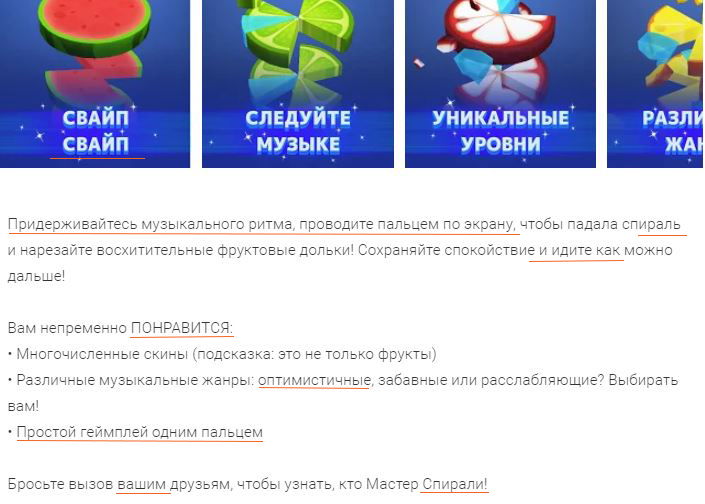 I often come across poor Russian translations of mobile games. Here is another example. 9 mistakes in a 50 words game description. Punctuation, style, grammar – you name it! 1) “Свайп”. Translator invented a neologism for a word “swipe”! As for me, I don’t know, what a word “свайп” means. Players will have to use their imagination to find out the meaning. To translate a word correctly, one had to find a synonim to a “fast finger gliding”. A good option is: “вжух!”. It’s a fast action like gliding, swiping or winging, with a dramatic effect. A much better choice, indeed! 2) Придерживайтесь музыкального ритма, проводите пальцем по экрану”. What a clumsy translation for “Stay on music rhythm, swipe the screen”! The translator litereraly says: “Adhere to a music rythm, move your finger upon a screen”. One may adhere to a policy or to deadlines, but not to a music rythm. And as for “swipe” they also translate it literaly. We have to rewrite this segment: “Скользите пальцем по экрану в ритме музыки” – “Swipe the screen with the beat”. It looks much better now! 3) “Идите как можно дальше” – a literal translation for “go as far as possible”. When in English it sounds like “pass through a game as far as possible”, in Russian it only means “walk with your legs as far as possible”. Sounds strange, doesn’t it? A good translation sounds like “пройдите как можно дальше” – “pass through a game as far as possible”. 4) A comma is missing after “спираль”. It’s a depenent clause, and it should be separated with a comma from BOTH sides. 5) “ПОНРАВИТСЯ” – a singular verb form is used instead of a plural one. There are three game features, and a plural form of the verb should be used. 6) “Оптимистичные” – another case of an official trnslation for “upbeat”. The translator uses a word “optimimstic”, but it’s a bad choice for a funny musical game! A forecast may be optimistic, but not a music track. “Joyful” – “весёлые” fits more. 7) “Простой геймплей одним пальцем” – WHAT? Dear translator, are you really a native Russian speaker? It’s a nonsence and just a calque for a “Simple one-finger gameplay”. A good translation will sound like “Управление одним пальцем – все просто” – “Control your moves with a finger – so simple”. 8) “Вашим друзьям” – another case of calquing English grammar. In English you say “your friends”, because you have to put smth before “friends”, but in Russian you can omit a possessive pronoun. Simply “друзьям”, without “Вашим”. 9) “Мастер Спирали” – wrong capitalization as a result of calquing English grammar. English authors capitalize every word – “Helix Master”, – but in Russian we capitalize only the first one. “Мастер спирали” is the right translation.